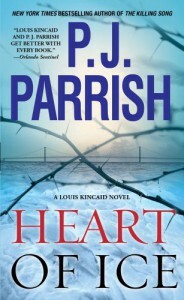 I enjoyed the previous two Louis Kincaid novels, and was looking forward to Heart of Ice where I’d hoped for more of Louis and Joe, or at the very least a forward movement of some sort for Louis. I’m happy to say I got both, and having it wrapped up in a twenty-year-old cold case just makes this a sundae with a cherry on top.We start out in the past, with a boy who’s wondering how to get out to the island when the ferry’s not running. And switch to the present with Louis and Lily exploring Mackinac Island and finding a pile of bones. That’s a great kid-friendly vacation right there, folks! *shudder*When Louis is asked to help with the investigation, he can’t refuse, even if it means his vacation with Lily is cut short. On the bright side, Joe shows up to help out for a few days. Before you know it, he’s almost a cop again.Heart of Ice isn’t as gory and creepy as the previous two Louis Kincaid novels I read, but you’re still bouncing on your toes while waiting for Louis et al to figure out whodunnit, and better yet, what was done… This series should be on all crime-fiction fans’ lists.drey’s rating: Excellent!